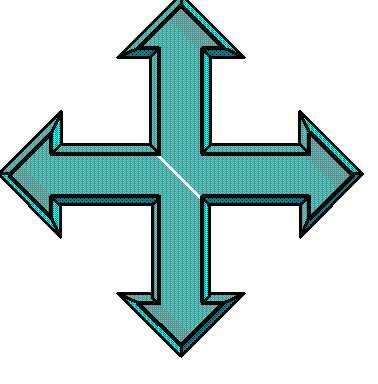 These are the primary lines I am searching for. Check the Lineage by selecting a surname. EDWARDS, MILLER           1850 - now; Hamilton Ont. ; B.C. ; Buffalo, N.Y.
HAYDEN                    1850 - now; Hamilton, Ont. The descendants of Silas Vandervere YORK. Visit the YORK Family Page for other YORK connections, and the new YORK page at Rootsweb. A new page of YORK(E) vital events for Ontario. This is incomplete, presently listing 1143 records. Includes many births, marriages and deaths from the Indexes to Ontario Births and Marriages. July 15, 2001. These pages are located on my Rootsweb site. I've included a search engine for your convenience. Ontario Birth, Marriage and Deaths Indexes. A helpful explanation of the Archives of Ontario Vital Stats index films. Provides a cross reference of their numbers to the corresponding LDS film numbers for Ontario Birth, Marriage and Death Registrations. Information on deciphering the index information is included, as well as information on where to look for missing records. Complete list of all Archives and LDS film numbers for Ontario Births, Marriages and Deaths. How to order a registration from the Archives or Latter Day Saints. Donna Scott has found a new source for information on missing ancestors, those who don't show up when you search the Indexes. Read about her discoveries in The Unknown. This section of my index has grown large enough to deserve its' own submenu. If you select this link to Early Ontario Records you will find a large selection of old records from some of the ministers tending to their flocks in the late 1700s and early 1800s. Other non religious records are also included. Ontario Birth, Marriage and Death Registrations. Office of the Registrar General Application . I have copied the application instructions from a current form used to order birth, marriage or death certificates. If the event occurred too recently to be at the Archives, you must contact this branch of the Ontario Government to get the information. Includes fees and phone numbers, as well as the address. Be sure to read the entitlement section! Note that there are now two forms. In the wake of the Sept. 11th. attack new procedures are in place to tighten up the rules to obtain a birth certificate. A new page that equates the films of the Latter Day Saints with those of the Archives of Canada for the 1871 census. It also has a bit of helpful information and links to related sites. It should be an aid to using this resource. In an effort to reorganize my site I have created a new page of Links that you may find of some help. It includes some of my favorites, as well as others recommended to me. The first section is for Ontario Links followed by sections for Canada and the World. I have created a subsidiary website, and have moved some of the larger files onto the new site. Ida Reed has provided me with a transcript of the Parish Register for Our Lady of Holy Angels Roman Catholic Church, Brudenell. Lots of Irish and French surnames, along with some German ones. Covers 1862 to 1910. Another of Ida Reeds' projects was to transcribe all of the Wills in the Algoma District Land Office, as well as films of records at the Archives. Lots of records, many of them for people who resided a long way from Algoma District. The Wesleyan Methodist Baptism Register is a large new set of pages created from files supplied by Ida Reed of Sault Ste. Marie. She has transcribed the entries of over 100,000 baptisms from the early 1800s to the early 1900s. A monumental work. Check it out to see if your ancestors are listed. The Mugan Manuscript details the early history of Lambton County and the Roman Catholic Church. A good source of information on Early Ontario RC missions and the travels of the priests. The book entitled 'New England Captives Taken to Canada Between 1677 and 1760 During the French and Indian Wars', is a two volume set written by Emma Lewis Coleman and published by The Southworth Press, Portland, Maine, in 1925. It is a large work with Vol. 1 at 438 pages and Vol. 2 at 452 pages. Included are pages with the first chapter, an excerpt from the books and the index. T. F. Wood and Co's Canadian Newspaper Directory, printed in 1876. Lists all of the papers and the year they were established. Includes a history of Canadian Newspapers. I have transcribed and created a page for W. W. Butcher's Canadian Newspaper Directory. It was published in 1886 and lists most if not all of the newspapers in Canada at that time. THE EMIGRANT'S GUIDE TO THE CANADAS is an 1833 book printed in London, Edinburgh and Dublin, and was intended as a source of information for prospective emigrants to Upper and Lower Canada. It has only a few names, so is not a good source of genealogical records, but is a fantastic source of some of the historic information about the Canadas in the early part of the 1800s. There is a fine line between genealogy and history, and this book really helps with the history part. See below for another book by the same name. Gazetteer and Directory of the County of Grey for the Year 1865-66 by William Wye Smith. This directory contains almost 7600 names of residents of the 17 townships of Grey County, taken by Mr. Smith from the assessment rolls for 1864. Every place with a name is noted and described in the Gazetteer portion. Almost every town or crossroads lists some of the residents. This is a large resource of 330 printed pages which have been transcribed into 8 files, each of around 100k. Connor and Coltson's Directory of the County of Ontario for 1869/70. This directory lists several thousand names of the residents of Ontario County, organized by town and village or by townships. The township lists give concession and lot information for the residents listed. The descriptions of the towns and townships is not detailed but helps to understand the makeup of the area in 1870. Three parts, with an index by location. In 1822 Wm. Watson published a book titled "The Emigrants' Guide to The Canadas." This book predates the one above by 11 years and is much shorter, but contains a further trove of history of early Canada and the state of the country at that time. Again not much genealogy. The History of Simcoe County by Andrew F. Hunter is a 2 volume set that includes quite a bit of information on individuals and the history of the county. The Directory of the County of Peel, by John Lynch. It is not yet complete but for now contains the first third of the book which lists early residents of the County. Excerpts from a Directory of Wellington County, 1867. These excerpts were provided to me by David Pike, and it was his transcription of them that we can thank for these new pages. They detail the residents of thirteen townships in Wellington County. Excerpts from County of Oxford Gazetteer and General Business Directory, for 1862-3. At present this is incomplete, and will be added to as I can finish individual townships. The general county information will not be added till after the township resident lists, which include occupation, lot and concession. Blandford, Blenheim, Dereham and East Nissouri completed. 1901 Census of Canada Microfilms. Includes the National Archives of Canada and LDS film numbers. All Provinces and Territories. Prefaced by a description of the information included in the census. Sir John Johnson's Rent Roll of the Kingsborough Patent in Tryon County, New York. Many names in the list are of loyalists who settled in Canada after the American Revolution. Historical Atlas of the County of Wellington, 1906. Biographies of many of the early citizens of the County. This project is in cooperation with the Wellington County Genweb Site which includes some of these biographies. Eventually I hope to produce all of them here, but for now, selected biographies can only be found at their site. Many connected surnames can be found in individual biographies, so if you have ancestors in Wellington County, a careful search may find new information. National Registration File of 1940 . At the beginning of the Second World War Canada took a survey of the entire population, and the records are still kept by Statistics Canada. They are used primarily for proving age qualifications for Canada Pension and Old Age Pension, but the records also can be invaluable for the interested genealogist. Read all about it. I live in Thunder Bay, Ontario, Canada. Wonder where it is located? Check this map. The following items are of interest if you are fortunate enough to claim Finnish Roots. 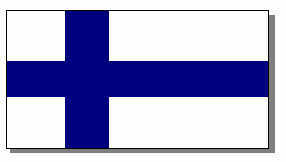 There is some Thunder Bay and area historical information that isn't specific to our Finnish population. Here are some links that should be very helpful. Jude Mitchell has a great website with lots of local resources and includes many Finnish settlers. Dave Nicholson has a very helpful site for anyone doing local research. He comes highly recommended as a local researcher. Note especially the Databases, which include many Finnish-Canadians. 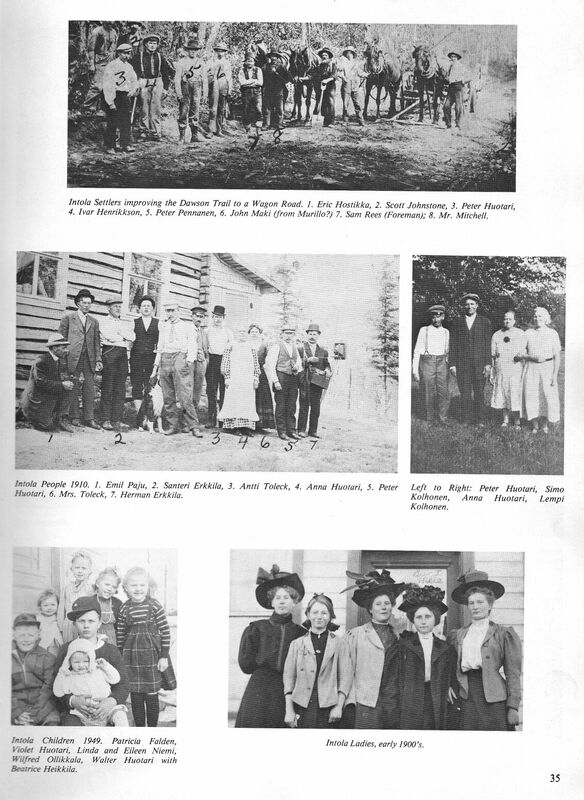 The Familysearch Pilot Website has a number of databases that should be of great help for Finnish-American research. These include Minnesota and Wisconsin state censuses, Michigan BMD registrations, and much more. A growing resource. There is a very helpful new website for the New Finland District of Saskatchewan. There is a local history book titled Oliver Township -- The First Century Unfolding 1879 -- 1979. 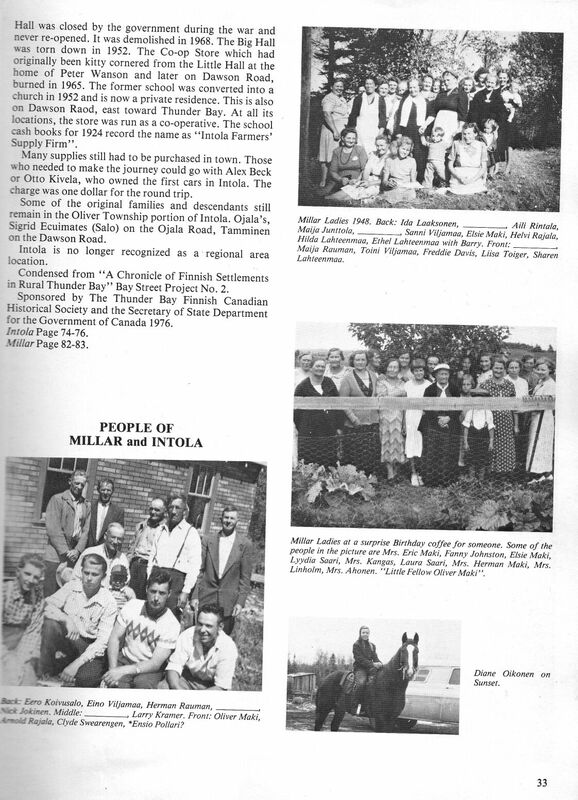 It includes four pages devoted to the Finnish communities of Intola and Millar. Page 32. A history of the two communities. Page 33. End of the history article, plus some photographs. Page 13. 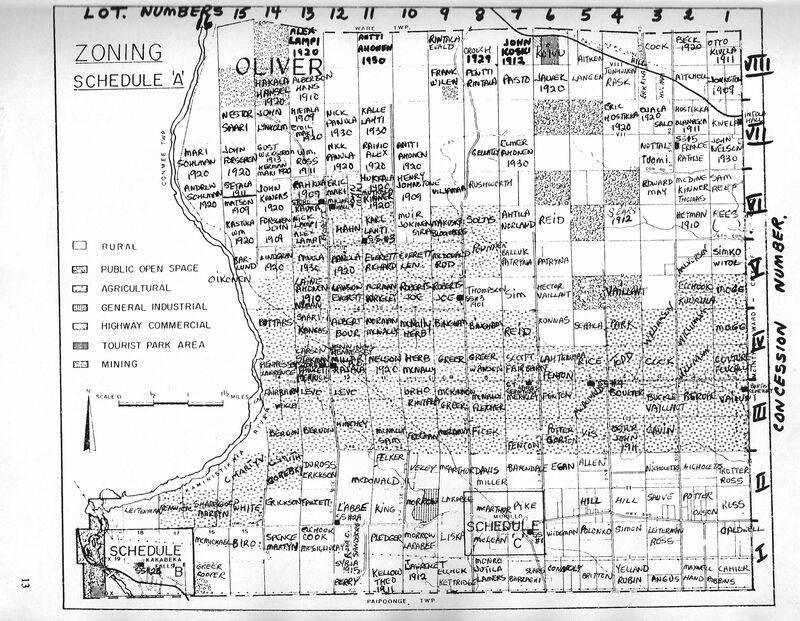 A map of the Township showing lot locations of many early settlers. 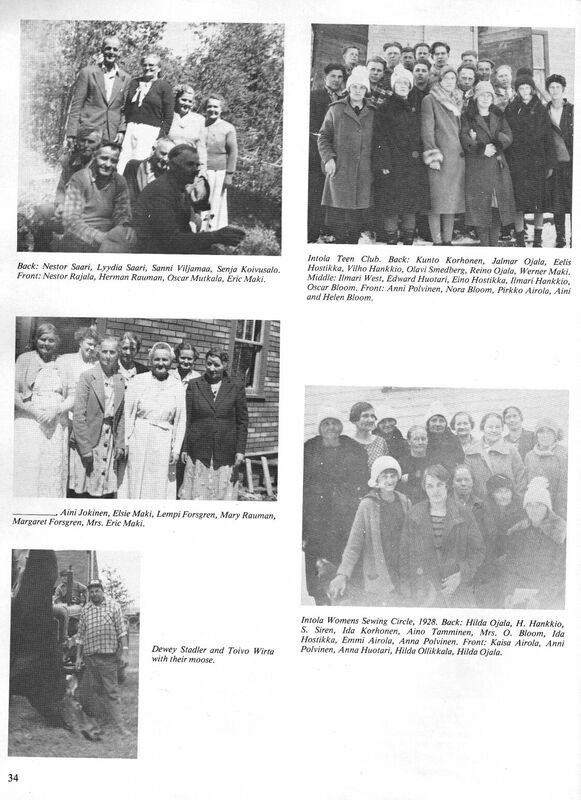 A list of families included in the Family Histories section of the book. Contact me if you want a copy of the image of the page that includes a family of interest to you. I found an interesting historical article in a local newspaper I happened to be reading on microfilm in our library. It lists a large number of local area farmers and the construction projects they completed in 1932. If you have local roots some of these names could be of interest to you. 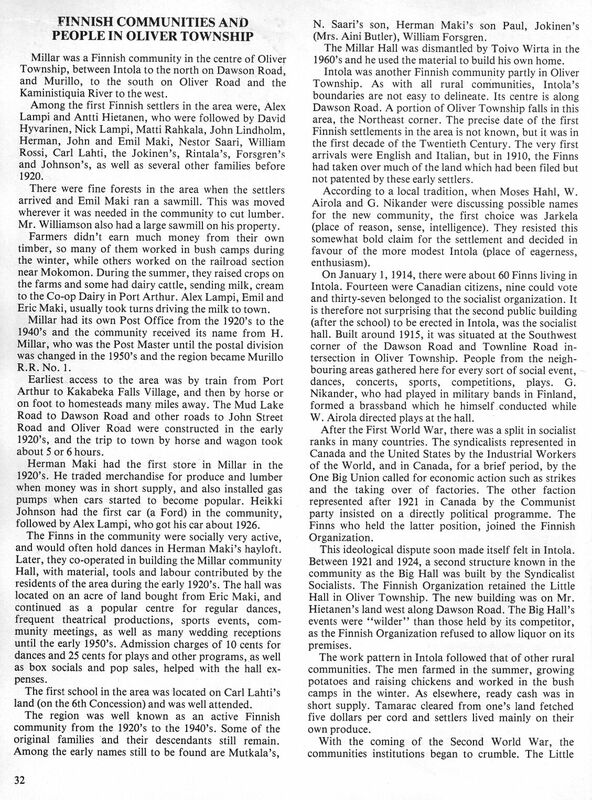 For a while now I've been collecting information from the obituaries that are printed in The Chronicle-Journal here in Thunder Bay. I included only the ones that were obviously for people with Finnish Roots or spouses, noting the maiden names of the women when it was listed, as well as the place the person was born, if that was listed. It is possible that I may have missed one or two but I've tried to be conscientious with these records. More will be added in the future, as I intend to start working back into the older papers on film in our library as time permits. I do not have all of the original copies of these obituaries. The date of printing is noted so that copies can be tracked down if you wish. Since this page will be updated regularly you may want to use the MindIt feature at the top of this page to be notified when changes occur. Earliest record is Nov. 1, 1995. Latest update Mar. 24, 2003. 954 records. it a treat and I've included the recipe here. It isn't genealogy, but it tastes great! or 716 when you include their Canadian born dependants. An index to the book "A Chronicle of Finnish Settlements in Rural Thunder Bay ". I managed to create this index after a lot of trial and error and I hope it does the job. It includes all surnames mentioned in the book. Most but not all are names of Finnish immigrants to the Thunder Bay area. If you had ancestors in a rural settlement of this area check out the index. Totals about 1550 names, with some repetitions. If you find someone of interest let me know and I can check the reference. With all of the publicity that the Titanic is receiving these days, I decided to add a copy of a newspaper article listing the Finnish passengers of the Titanic. Max Hahto of Nanoose Bay on Vancouver Island was kind enough to create an index to the portion of the book "Along the Burnt Lake Trail" that relates to the early history of the Finnish community of Kuusamo in Alberta. His work is placed here with his permission.